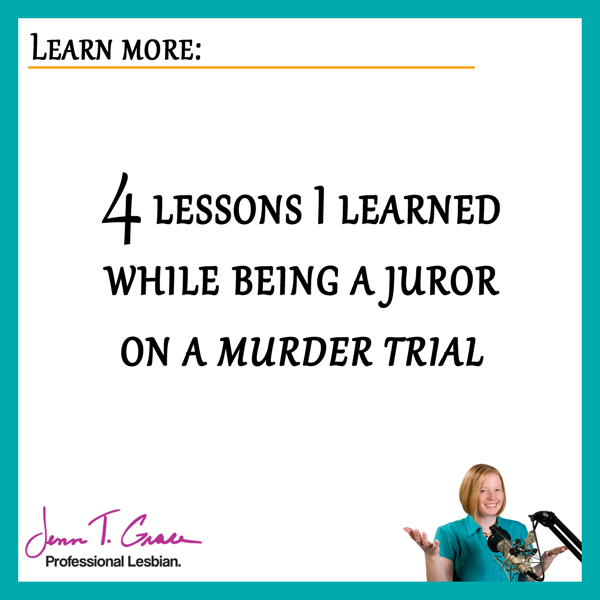 In early 2015, I spent time away from my business to fulfill my civic duty as a juror on a murder trial. This experience was a first for me. During the jury selection process I had a sneaking suspicion I would end up on a case. I wasn’t prepared for it to be a criminal case. During these 3 weeks I learned a tremendous amount about business, sales, and life. Now, I would like to share with you the top 4 lessons I learned by being a juror on a murder trial. Background: This was a complex case, not that I have anything to compare it to, other than the attorney’s and the judge telling us so. There were a lot of parties involved, therefore a lot of witnesses and evidence to review. It was a true information overload. The best way I can describe the overload is if you watch a show like House of Cards. The show is designed to give you clues about what will be happening not just in the next episode, but five episodes from now. So you have to pay super close attention to ensure you don’t miss anything, even if it doesn’t seem relevant in that moment. But the difference is you have the general framework in which the show is portrayed, you have previews, and you have what other people are talking about to help you piece it altogether. On a trial you get the testimony and that’s it. No comparing notes with others, no outside influence, nothing. You essentially have a barrage of information thrown at you, that you cannot talk to anyone else about. This is magnified by the fact that your recollection of this information will be what decides someone else’s fate. Overwhelming is an understatement. This experience lead me to realizing many things about the way anything in life can truly be a sales process. Here are just a few of my, many, many, takeaways. How many times has someone said this to you? Cliche isn’t it? But, wow, this couldn’t be any more important in the courtroom. This case was complicated. On the first day of evidence we heard from two police officers, the father of the victim, a detective, a sergeant and the medical examiner. This was all in the first day! However, with all of this carefully choreographed testimony we left the courtroom on day one not knowing a single thing about the defendant or his whereabouts during the crime. It was carefully planned for us not to learn about this until later. I left the courthouse after the first day knowing a lot but knowing absolutely nothing. We had no information on the defendant – at all. The attorney’s spent the day setting the scene for us. Even though we knew nothing about the defendants role in the crime, it was obvious from the outset that the defense had no case. Her body language said it all. I, of course, remained objective through the entire trial weighing all sides of the story and evidence with equal weight. The defense tried her damnedest with her spoken words but what she wasn’t saying actually told the story better. She presented herself somewhat sloppy often with a wrinkled suit and untucked shirt. Her poor body language overshadowed her words. She didn’t speak with a confident tone and used ‘umm’ way too often. It even went as far as getting the defendants name wrong during her opening statements. She was often found swaying in an odd manner around the courtroom. One could say this was a tactic but it wasn’t done in a crisp enough way to be seen as such. Instead, she looked disheveled. She would rustle her legal pad in an attempt to appear authoritative, but, that too, looked sloppy. The questions she asked each witness were carefully thought out, but her delivery was poor at best. The prosecution tore apart her words and the words of the witness each and every time. Rather than calmly listen to the prosecution and the witnesses, she would lean far back in her chair, chuckle to herself, make eye contact with the jury, apply chapstick – you name it. She acted as if she wasn’t paying attention to what was happening on multiple occasions. Again, this could be a poorly executed tactic. Regardless of what tactics she may or may not have been using, her actions spoke ten times louder than her words. In a business setting this is the difference between getting the sale or not. Unfortunately in situations like the courtroom, someone’s life hangs in the balance. Lesson number two stems from the first lesson. Years ago my business coach said to me ‘he wreaks of desperation’ in reference to someone with whom I was working with. Since I was so close to the situation at the time, I couldn’t quite see what she saw. It took me years to fully understand her comment. Her point to me at the time was – if you go into a sales meeting presenting yourself as if your family won’t eat unless you get that sale – you wreak of desperation and people can see that a mile away. Desperation can be loud and ugly even when you don’t see it. This trial experience put this comment into full focus for me. Unfortunately for the defense she wreaked of desperation from the second she spoke to the jury. In her defense (no pun intended), she didn’t have a lot to work with. The prosecution had a very strong case from the beginning which included a confession from the defendant. As the defense it’s hard to compete with that. Given that she didn’t have a lot with which to work, she was probably doing the best she could. However, everything about what was said, how it was said, how she shifted about the courtroom – sent messages of despair. At some points she may have well just said “We’ve got nothing” and left the courtroom. The deck was not stacked in her favor. Any legal drama on TV can reveal that the courtroom is all about putting on a show. While I have more friends that are lawyers than any other profession, I don’t have a solid handle on how our justice system operates. I have a hunch, unless you are a lawyer, you may not either. I definitely have a better understanding now, for which I’m grateful for. But regardless of its intricacies, the most important thing in the courtroom is the showmanship – getting the sale. Or in this case, getting the guilty or not guilty verdict. I walked away from this experience wanting to be the prosecutor. She was so calm, cool and collected the entire trial. She knew the exact questions to ask to get the exact answers she needed to build her case. It was pure magic as she worked the room. While she had the upper hand in the case, she still had to build it in a methodical systematic way. Her communication style was direct, to the point, and flawless. She never said ‘umm’ and she exuded confidence at all times. Whether she felt like she had a slam dunk case or not, her body language and verbal communication lead us to believe she did. She was unwavering in her commitment to find justice. Unlike the prosecution, the defense began to crack early on. From her audible gasps to her occasional disheveled appearance – you could see it getting to her. She couldn’t control, the situation and she let it get the best of her. She had the hand she was dealt and had to play it the best she could. Unfortunately, there was nothing she could do to change the facts of this case, there was no good outcome for her or her client. In business, if you show up to a sales meeting and you don’t present yourself well in both your verbal and non-verbal communications – it is going to be obvious to those around you. If you don’t have a good hand or believe you aren’t as good as your competition – don’t let anyone see it. The expression “fake it until you make it”, exists for a reason. Sometimes you have to act confident even if you believe you are on the losing side and are scared to death on the inside. When you show up unprepared for anything you are at an immediate disadvantage. Even if you don’t feel you have the strongest case you need to put every effort in to convey that you do. You must come prepared to close the sale. Not to talk about the potential of a sale. Not to shyly ask for sale. But to straight up close the sale and get the business. Preparation is key. I stated earlier that this was a complex case. There were a lot of parties involved, therefore a lot of witnesses and evidence we needed to keep track of. As someone with not the greatest of short-term memories I was anxiety ridden over forgetting something important. Thankfully, we were allowed to take notes throughout. Imagine a sales meeting where you are throwing a barrage of features and benefits at your potential customer. Your message isn’t clear and you are sending them into the land of information overload. Then your competition comes in after you – succinctly shares their message and provides a recap/overview of the offering in an easy to remember digestible way. Who do you think has the better likelihood of getting the business? My guess is going to be the person with the clear message that is rememberable. During the closing arguments, we hit the pinnacle of showmanship. The prosecution had to prove the defendant was guilty on three separate charges. Within each of those charges she had 2-3 specific additional items she had to also prove guilty on, beyond a reasonable doubt. Over three weeks of testimony, it boiled down to 7 key points she needed to prove the defendant was guilty of. Her secret weapon? A PowerPoint presentation! She went through each and every single count, one by one and made her case in a very systematic way. She referenced and cited key testimony from witnesses to illustrate her points. Her closing argument was one of the best sales presentations I’ve ever seen. She needed to sell the jury on why the defendant was guilty. She did it in a way that reduced my level of stress because she recapped and highlighted all of the key points in a chronological order that built the case from the previous weeks of testimony. It was like the Cliff’s Notes version of the trial. One of the most fascinating points about the prosecution’s closing arguments was the entire time she went through her PowerPoint with us, her back faced the defense and never once did she turn to see their reactions. She was stone cold confident in her actions and words. She should have turned around because the defense was putting on a show. A few times the defense through her arms in the air, let out a few audible groans, a few sneers, among other antics. But the prosecutor did not react or acknowledge anything going on behind her, even if the jury seemed distracted by it. The prosecution came prepared to close the deal, while the defense swayed and weaved her way through the courtroom with her scrappy legal pad and nothing substantive to say. It was very clear who came prepared and who didn’t. The business lesson here is even if you know you are going to lose – show up prepared. Try your hardest to get the win, even if it doesn’t seem likely. At the very least it’s good practice for when you are in a similar situation next time. I am going to confess something here…. Being a juror has been a ‘bucket list’ item for me. But I could have done without it being a murder trial or lasting 3 weeks. I’m a dork, I know this. What I did find awesome is that I was able to really prioritize my business and find very efficient ways to keep my business moving steady in my absence which was an incredible lesson to learn. I just have a lengthy backlog of phone calls to make now – and you may be one of them! This rates as one of the most fascinating and haunting experiences of my life. I learned I can go without sleeping well for 3 straight weeks, although I don’t recommend it. I learned the incredible way in which our legal system works. And I learned that there is amazing overlap between selling a product/service and selling a verdict. While this is a longer post than usual, I hope you enjoyed it. As always, I would love to hear your thoughts! Jenn, I’ve not had to be on a jury, and i dont have much of a desire to do so, but your writing gives me thoughts to consider should I get called. I am overjoyed at your calling out the laser who uses “umm” as a brief respite. I think it is the ugliest non-word that “professionals” use all too often. I think most are afraid to become jurors, but your article gives me a hint of what to expect if I’m called one day. Thank you…it was an interesting article in all aspects. Thank you for taking the time to read my story and reach out. Being a juror was quite the eye opening experience…to say the least! If you ever do find yourself on a jury please reach back out and let me know about your experience!